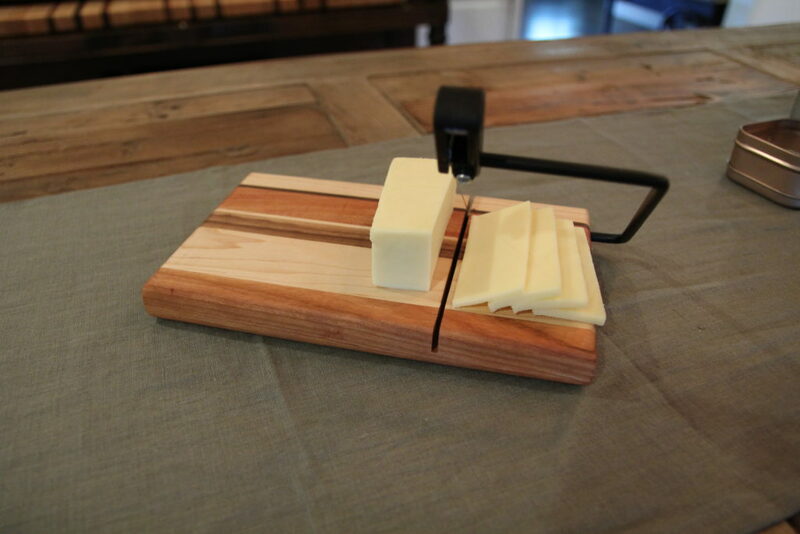 Today I’m building a cheese cutting board out of some old cut offs and scrap pieces from previous projects. 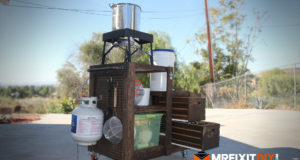 It’s a relatively simple project to knock out and can be tackled in about an hour. 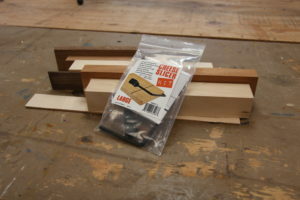 The first thing to do is to get all the wood you’re going to be using ripped and cut to rough dimension. 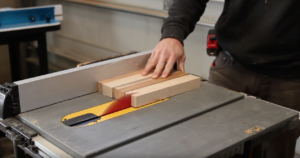 You’ll need enough wood for basically a 10″ x 6″ x 1″ rough rectangle to start with which we’ll later cut down to 9 1/2″ x 5 3/4″ x 3/4″. This is the recommended size that comes in the instructions with the kit. (I decided to make mine a little thicker for the finished board so I ended with a 1″ board and started with my boards at 1 1/4″. 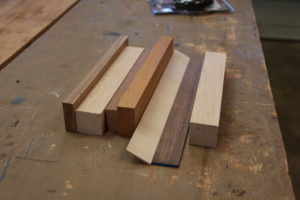 For my project I used off cuts and scrap pieces from previous builds and had 4 different types of wood (maple, walnut, cherry, and mahogany). 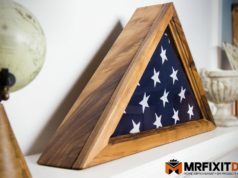 You can use any type of wood that you have available or even use one solid piece of wood if you wanted to instead of the multi-colored board I made. 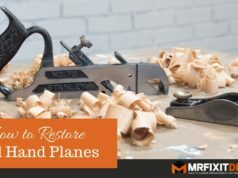 Rip the pieces of wood to your desired thickness and then cross-cut them down to roughly 10″ long. I’m using DAP’s Rapid Fuse for this project because it’s very fast setting and I’m working to get this done quickly (and full disclosure they are a sponsor of mine so I like to use their products as much as possible). 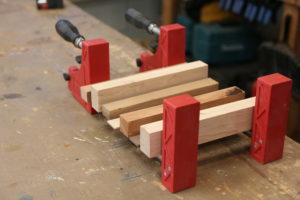 It works great for this project because it’s a small glue up so I don’t need a ton of working time to get it done. Keep in mind if you’re using Rapid Fuse you don’t need nearly as much as traditional yellow glue. 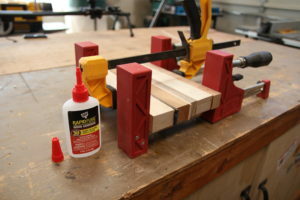 The clamps I’m using are Jet Parallel clamps and a Dewalt trigger clamp. The total set up time is about a half hour but the Rapid Fuse sets in about 3 minutes so you have to work a little quickly. 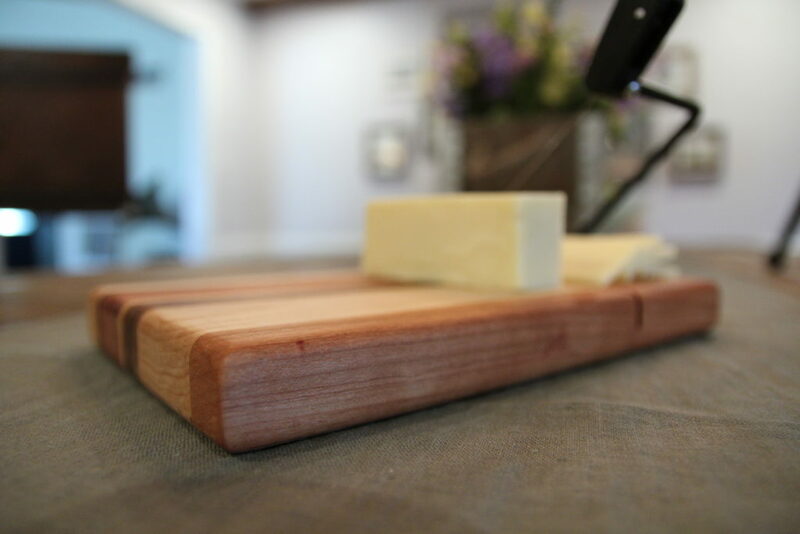 Next you’ll need to cut your cutting board down to it’s finished dimensions and either plane or sand it down to it’s final thickness. The order in which you do these 2 things doesn’t really matter. 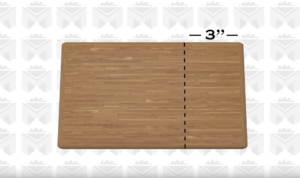 In the video, I cut the board down to size and then planed it down but you could do it the other way around if you wanted to. Again, the final dimensions I went with were 9 1/2″ x 5 3/4″ x 1″. 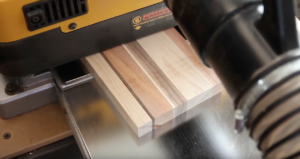 If you don’t have a planer you could just sand the board down which would take a bit more time, but totally doable if you don’t have a planer. Next you’ll need to make the kerf cut for the wire to pass through. 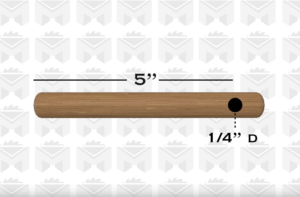 The instructions call for this to be 3″ from the right end of the board at 3/8″ deep. Because I made my board slightly thicker I adjusted the blade depth to 1/2″ for my cut. With the kerf cut, it’s time to drill out the 1/4″ diameter hole for the arm to go in. This is the trickiest part of the whole build because it requires drilling a 90 degree hole in the end of the board 3 7/8″ deep. I actually had to chuck my drill bit at it’s very end in order to make it deep enough because the bit I had wasn’t that long. 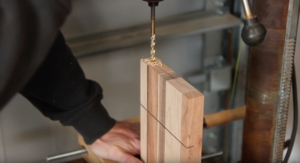 If you don’t have a drill press this can be a little tricky but Izzy Swan has a pretty good video on how to drill a 90 degree hole without a drill press that you can check out here. I test fitted the hardware and found that the arm and wire didn’t quite line up with the kerf I cut, but I bent the arm slightly and it lined up perfectly. It was pretty easy to adjust. I used a palm router and a 1/4″ round over bit to clean up the edges on the board before sanding it down to 220 grit with the orbital sander. You could skip the router if you don’t have one or maybe just want a more rectangular board. You could also just knock the corners down with the sander. Up to you. 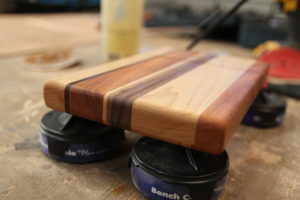 Lastly I added a couple coats of Howard’s Butcher Block Conditioner to bring out the grain and seal the board and reinstalled the hardware and this project is finished! 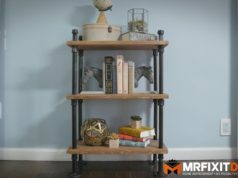 Thank you for checking out this project! 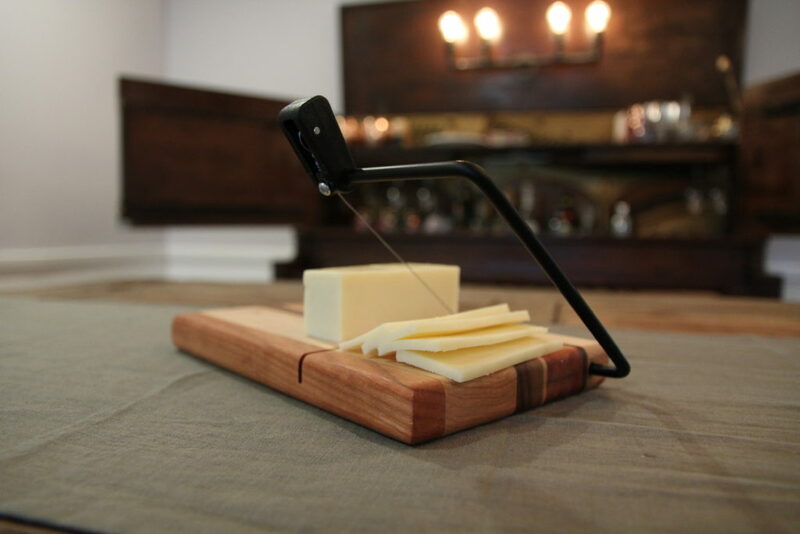 I hope it inspires you to tackle your own cheese board! 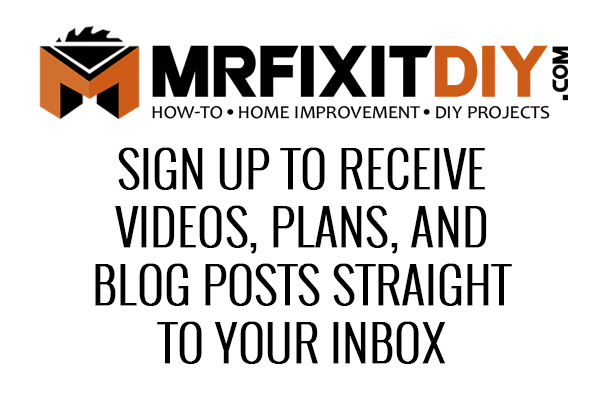 Please tag me in your projects on instagram mrfixitdiy so I can follow along!